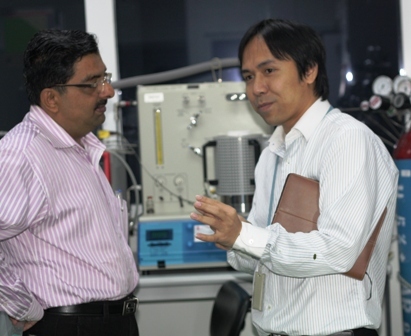 Dr. Kajornsak showing the chemisorption analyzer machine to Prof. Parimal during the lab visit. On 3 Nov NANOTEC hosted the visit of Prof. Parimal A. Parikh from Chemical Engineering Department, National Institute of Technology, Surat, India. Prof. Parimal is currently in Bangkok and is a visiting professor at AIT Nanotechnology Center. His expertise lies in the field of chemical catalysis and kinetics.At NANOTEC Prof. Parimal met with Dr. Kajornsak Faungnawakij, Head of Nanomaterials for Energy and Catalysis. Prof. Parimal is very interested in possible research collaboration in areas related to biodiesel enhancement project and joint research publications.He will conclude his visiting professor assignment on December 3, 2010 and return to India.